Likes have long been a way to effectively gauge consumer interest in Facebook content. But what do those likes actually mean? The vagueness of the Like button has long been a source of frustration for marketers. With Reactions, Facebook sought to reduce this ambiguity by allowing customers to express their feelings towards a post in a more specific way with six different reactions. Now you can export Facebook Reactions data from your page posts on any Woobox account and use the update to your advantage when running a post promotion. Why does this work? People are so bored, we scroll through the Facebook timeline endlessly looking for something interesting to do. The reactions provide that in general, but when you add the factor of winning a prize or even just giving your opinion to have your voice heard, a person is going to want to engage. 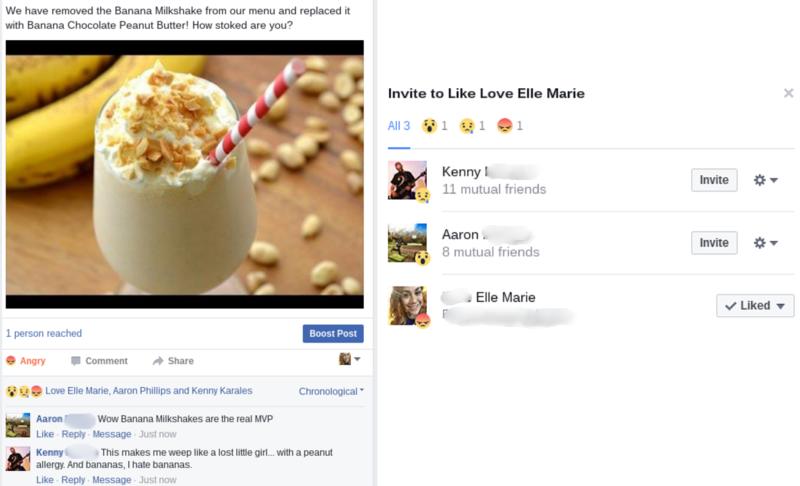 The reactions allow for a more customize interaction with your post and it also engages the users into participating. The snowball effect is brilliant… the more users who react to your post, the more that post is seen organically. Will people engage more? Of course, because they’re being asked their opinion! The internet has brought so much to the world, including the need for giving our opinions on almost everything. Our savvy users also have figured out analyzing post likes is a great way to gauge customer sentiment and now you can take it a step further with this additional data. Upon Export you’ll be given a breakdown of the number and type of each reaction. Finally, you’ll be able to prove your posts really have the WOW factor you always known they’ve had. As with all Woobox features, exporting Facebook Reactions couldn’t be simpler. In the Posts section of your dashboard find the post you want to see Reactions for, and click “Export Reactions” to download your Reactions file. The Reactions will have it’s own column. 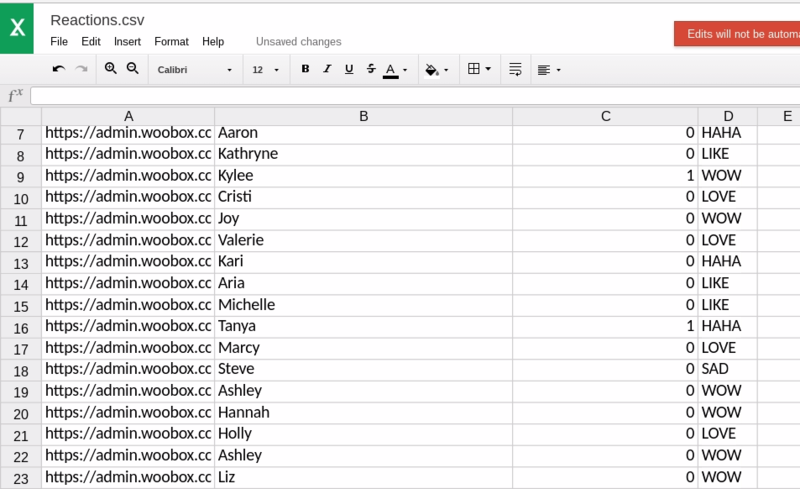 You can sort that column to easily view your data and remain ahead of your competitors. Ready to feel the love? Sign up for an account and start learning what content is wowing your customers today! Have questions? Hit us up at support@woobox.com. Feeling like you need a ha ha moment yourself? Learn how our winner picker works!